Our newest sweet flavor: Salt Toasted Coconut Double Chocolate. When you’re on idyllic Mackinac Island in Michigan’s beckoning Straits of Mackinac, every day is special and worthy of a toast! 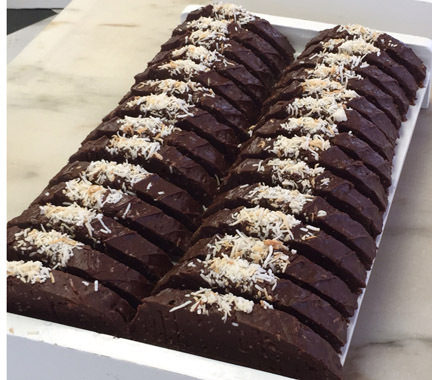 But on Tuesday, June 16, Original Murdick’s Fudge will be ‘toasting’ like crazy as we pour out our new super-delish National Fudge Day flavor for 2015 — Salt Toasted Coconut Double Chocolate. We’ve put this enticing combination of flavors through the test several times these past few weeks and now prounonce it … exquisite! And because we love it so much, we’re hoping you’ll try it, too, so we’re giving it away on Tuesday, June 16 at our two downtown Mackinac Island stores. Be sure to stop in! Your National Fudge Day flavor taste journey begins the second you break our new Fudge Day seal on your special box and feast your eyes upon what’s inside, a veritable mountain of deep-dark chocolate capped with a sprinkling of coconutty goodness. You’ll experience an indulgent slam-dunk of Belgium chocolate leading quickly to hints of sea salt and textured notes of house-toasted coconut. 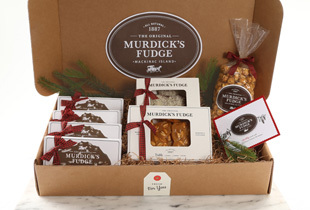 “It’s that sweet-and-salty combo that seems to win hearts over every time,” says Original Murdick’s Fudge owner Bobby Benser, who adds that the recipes he and his team use for this and all varieties of fudge feature only all-natural ingredients, most from Michigan including the sugar, butter, cream and more. And because National Fudge Day comes around only once a year, we can’t stop with just one special. 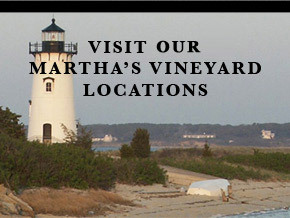 Not able to visit America’s most beautiful island on June 16? Check out our free shipping deal for online orders, which are good through July 1. 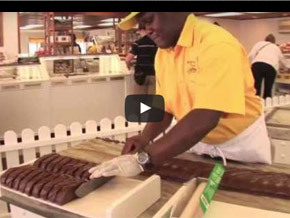 See other media stories about National Fudge Day on beautiful Mackinac Island. 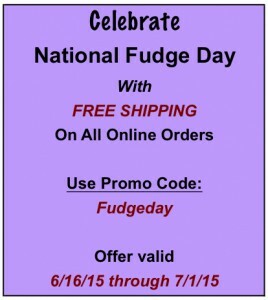 Gonzo on MLive, June 16 − National Fudge Day 2015: Get Free Fudge, New Flavor At Murdick’s on Mackinac Island. Michigan This Morning, TV 9&10, June 16 − MTM On the Road: The Original Murdick’s Fudge on Mackinac Island. Lansing State Journal, June 12 – Oh fudge! Mackinac Island celebrates its specialty. Chicago’s Journal & Topics Newspapers, April 24 – Fabled Fudge of Mackinac Island. As you are our best taste testers, do tell us what you think! That sounds just like heaven! Thanks Carol. Our new flavor will be awesome! See you soon. 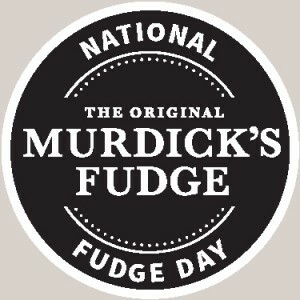 man…so wish I could stop in… petoskey, Martha’s Vineyard or mackinaw Florida is soooo far away… LOve fudge. Glad to hear about your love of fudge, Jeane! 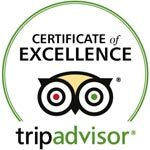 We only have three fudge shops on Mackinac Island and one each in Mackinaw City (at Mackinaw Crossings Entertainment Complex) and downtown St. Ignace. That’s a competitor in Petoskey and not our “original” Murdick’s Fudge company, which is the only fudge shop that can say it dates back to 1887. 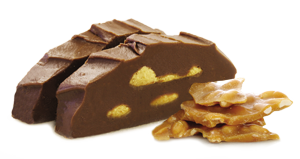 As owner Bob Benser, Sr. says, “imitation is a form of flattery.” Thanks for your support of Original Murdick’s Fudge of Mackinac Island. We hope you can make it to our wonderful island soon!